To speak of the beginning of a cycle in which every phase follows another in a continuum of changes with a repetitive structure implies that, though we are sufficiently objective to the cycle to be able to consider it as a whole, we are looking at it from the point of view of our particular position in it. The Movement of Wholeness itself has neither beginning nor end; it is a continuum of change which the human mind interprets as a series of moments in which events occur, every event being related to antecedent events and conditioning subsequent ones. What human beings call the first event of a series, its assumed "beginning," is the one before which no other (normally) can be known, because any antecedent belongs to a category (or level) transcending that of the knower's consciousness. Nevertheless, any "beginning" occurs as a result of impulses and determining factors which occurred at that transcendent level � and these in turn were determined by still previous occurrences. Every phase of a cycle whose structure is repetitive is related to every other phase, even though the events through which the phases operate need not be repeated exactly. Human beings usually interpret the relation between events in terms of cause and effect. Nevertheless the concept of causality is not the most significant (because not the most inclusive) frame of reference within which to define the relatedness of all that occurs within the cycle of being. A more holistic interpretation reveals that the cycle as a whole constantly acts upon its components and constituent phases. During the Day hemicycle, it does so by readjusting the centrifugal tenancies inherent in individual forms of existence and in relationships between them. Christianity interprets this readjusting activity of Wholeness as divine Providence. Yet, however we formulate a deeper, more holistic interpretation of the readjustment, it operates through individuals, who operate as agents or catalysts for it. In Mahayana Buddhism, the immense compassion of liberated Bodhisattvas is said somehow to absorb (insofar as the overall cycle allows) the centrifugal activities of human beings unable to serenely fulfill their places and functions (dharma) in the planetary process of human evolution. In Hinduism, Avatars like Krishna periodically incarnate to restore the dharma, that is, to restructure the process of evolution. Karma, if considered the cause-and-effect relation binding together the activities of human beings, is a valid concept where causal sequences can be given an objective meaning. This occurs in the world .of measurements � which is also that of quid pro quo ("This for that," "An eye for an eye," and so on) � the world dominated by the principle of Multiplicity; and the concept is essentially atomistic. It had to be formulated in such a way to meet the need of a humanity essentially in danger of being destructured by a centrifugal, egocentric individualism. This danger is inevitable; it characteristically defines the nature of the human state of being, which in turn refers to the section of the cyclic process witnessing the rise of the principle of Unity. The waxing of the principle of Multiplicity, which overtakes the power of the principle of Unity following Creation at the symbolic Sunrise, can be interpreted as the increase of randomness in the world of objective existence; but after the symbolic Noon, when the trend toward Unity begins to increase, order gradually overcomes disorder. What human beings call "freewill" reveals the operation of randomness at the level of human existence; the increase of order in the cycle of being is, as it were, appropriated by individualized human beings who compromise with the still powerful drive toward Multiplicity by insisting on following their own order. In such a manner, the power of the principle of Multiplicity becomes "introverted," and it does so as it is in retreat, gradually being caught up to by the principle of Unity. Therefore a paradox arises: human beings simultaneously insist on playing the game of Multiplicity as they, themselves, become ever more integrated yet separate "ones." This leads to the dualism of failure and success (as we shall see in the next chapter). Yet whatever any human being does as a self-isolated individual center of consciousness and will does not affect the overall structure of the cycle of being. 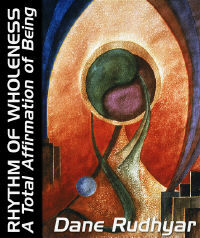 The destructuring forces of extreme individualism are balanced and harmonized by divine Providence or Compassion � that is, by the Wholeness of the cycle focusing itself in and through personages who act as agents of the Whole, as transpersonal human beings. Because of this interplay between destructuring and restructuring (reorganizing) forces � which is also the interplay of Multiplicity and Unity seen from a particular perspective � no cycle exactly repeats a preceding one. Structurally there is one basic form of cyclic order; existentially the actual events of any cycle are unpredictable, occurring in answer to whatever needs arise.